Once described by his doctor as “one of the sickest men in B.C.,” Phillip Moy lives life to the fullest today, thanks to cutting-edge treatments that saved him. “I think half the battle is the mental battle,” says Phillip Moy, who survived a rare form of blood cancer after enduring years of surgery and drug therapies. At age 51, Phillip Moy knows that he has beaten the odds and survived an advanced stage of a relatively uncommon form of blood cancer. But getting there was not easy. Years of his life were disrupted by this potentially deadly cancer and by the aggressive treatment needed to fight it. It started nearly 14 years ago when Moy hurt his left shoulder during a hockey game. The Vancouver resident experienced pain and a loss of mobility, but initial medical tests revealed nothing serious. However, a subsequent MRI – ordered after he injured his hip while jumping to celebrate a win by the Vancouver Canucks – showed tumours throughout his body. Moy learned he had stage 4 multiple myeloma, a blood cancer found in bone marrow plasma cells that is rarely detected in adults under 40. His oncologist told him he was one of the sickest people in British Columbia and told him to get his affairs in order. 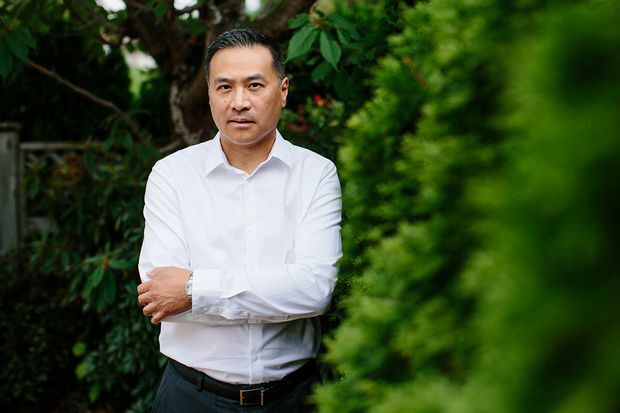 “You’re devastated, you’re scared because you have multiple myeloma and you have never heard of that before,” Moy said of the emotions he experienced when he got the news. Until then, Moy said he’d been the sort of person who made five-year plans but “you just have to put all your future plans and hopes on hold.” Moy, a chartered accountant, admits to feeling quite down at first. Eventually he made some “deals with God” that allowed him to focus on the future. The first was a wish to see his then three-year-old son finish kindergarten. Today, he’d like to watch his son, now 17, graduate from high school. For almost two years after his diagnosis, Moy said he spent every day at Vancouver General Hospital. To start with, he received radiation, then underwent one day of high-impact intravenous chemotherapy before he could receive an autologous stem cell transplant – one that used his own stem cells. Shortly afterward, he broke his left arm picking up a heavy box – a result of the multiple myeloma, which can cause soft spots in the bone and increase the risk of fractures. To deal with his injury and to avoid subsequent broken bones, doctors implanted steel rods into both arms and his left leg. Five months after his first transplant, he was once again given powerful chemotherapy, this time for seven days, before undergoing an allogeneic transplant – one that used stem cells from his older sister. Within minutes, Moy said he got sick with a high fever, convulsions and vomiting. Moy spent the first five years after the second transplant adapting to the changes in his body. He developed allergies to scented products, just like his sister who donated her stem cells. He also had to avoid public places for a time because of the increased risk of contracting infectious diseases owing to his “hybrid” immune system. “It’s my sister, it’s me; it’s all mixed up,” he jokes. Another side effect of his treatment was losing his ability to taste food, robbing him of the joy of eating at restaurants, he said. Not surprisingly, he dropped 25 pounds after his second transplant. Moy’s list of health problems continued until 2012, he says. The chemotherapy resulted in cataracts and retinal detachments (leading to four eye surgeries). His liver was affected and he developed gout. Then, as a side effect of the gout medication, Moy developed shingles. He also suffered another fracture, this time to his left shoulder blade while playing volleyball. There’s no way I’d be around if it weren’t for those who have raised funds (for blood cancer research) before I got sick. Moy says the possibility of a relapse doesn’t affect how he lives his life, though he does make sure to take vacations, exercise, eat healthier foods and avoid stress. He gets checked every four months for multiple myeloma and annually for mouth cancer, a risk factor for transplant patients. If the myeloma recurred, “I would feel devastated, yet grateful for the extra time I was given,” he says. Meanwhile, Moy is back to playing hockey again and volunteers as a coach for his son’s hockey team. He also gives back by talking to cancer patients and participating in the Leukemia & Lymphoma Society of Canada’s annual fundraising event, Light the Night Walk, with his team “Iron Will” – its name inspired by the steel rods in his body. “There’s no way I’d be around if it weren’t for those who have raised funds before I got sick,” Moy says.